‘The Magic Money Myth. A Guide to Banking’. The Socialist Party. 30 pages. Since the Crash of 2008, blamed rightly or wrongly on the banks, there has been a renewed interest in how the banking system works, and not just among regulators. At the Occupy Camps that sprung up in 2011 this was a major topic of discussion as those there looked for an alternative to capitalism, at least in its present form. Leaflets circulated reviving money theories of yesteryear and criticising ‘fractional reserve banking’. The Green Party too discussed the matter and committed itself on paper to the theory that banks can create money out of thin air. Money theories and denunciations of ‘banksters’ are all over the internet and get a hearing from those trying to understand why the present economic system doesn’t work in the interest of the majority. Some of these theories are just plain wrong, factually mistaken about what banks do and can do. All assume that banking or monetary reform can improve the position of the majority class of wage and salary workers. But it can’t as these problems arise from the capitalist system of minority ownership of the means of life and production for the market and profit rather than to meet people’s needs. Monetary reform is a red herring sending in the wrong direction people who are looking for a way out of capitalism. If implemented it would not solve the problems that the majority face as it leaves their cause unchanged. 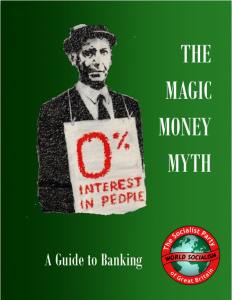 In this pamphlet we set out, as part of explaining how the capitalist economic system works, to expose factual errors about what banking is and how banks work. There is nothing especially bad about banks compared with other profit-seeking capitalist enterprises. They are merely in a different line of business. Banks are not the cause of the problems that the majority class face. It’s capitalism and its production for profit. The way-out is not to reform banks or the monetary system but to abolish capitalism and replace it with a socialist society based on the common ownership and democratic control of the means of production. There would then be production directly to meet people’s needs and distribution in accordance with the principle “from each according to their ability, to each according to their needs,” and banks and money would be redundant.